Plants… we have ’em here at Crow Cottage. Sometimes I think we are shrinking and the plants around us are starting to swallow us up. Unchecked, they may just do that. 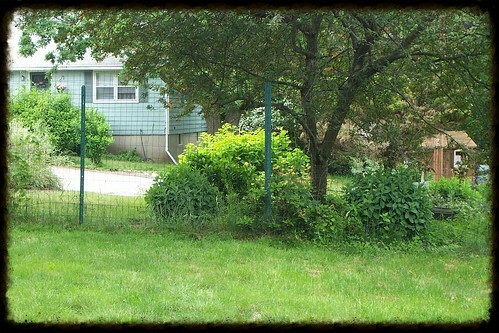 There is a tiny bit of the fencing showing, looking over into the neighbor’s yard, that I want to cover up with plants. But Paul insisted he had planted something in there with a delicate pretty white flower, but I didn’t see anything but what looked like a giant weed growing there. Now I can see it is blooming and I love it. For the life of me I can’t think of its name, but I will, at some point. 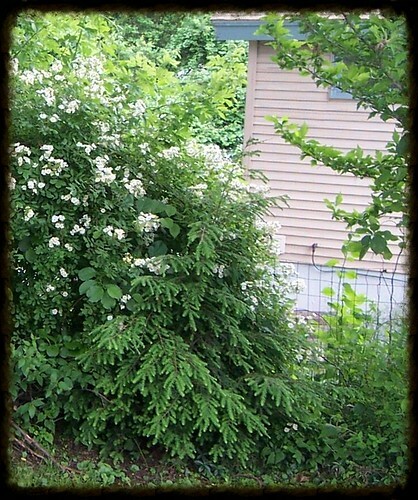 (I think Paul told me it’s a “spirea”). He told me the name of it, and it’s an old fashioned plant that was here when we bought the house, but we dug it up from in the middle of the front yard. Now a new one, or rather a transplanted one, has sprung up over by that fence, so I think now that the small area that is still bare along the fence will soon be covered over. We also planted that hemlock pine next to the bush and when we planted it, it was only about 2 feet high, and that was about last year. Look how big it’s gotten in just a year! I’m starting to think that may need to be moved again — but where? 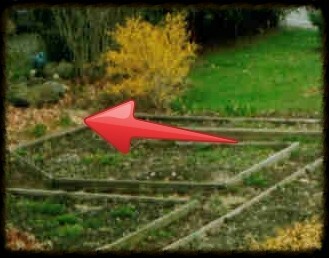 We’ve just about filled up the good available spots in our garden with plants now. It may be a large lot, but it’s getting full. I don’t often get out to the street to see that plant up close, but I think I can see buds on it where the beautiful blue flowers will bloom. I will keep you posted on those. 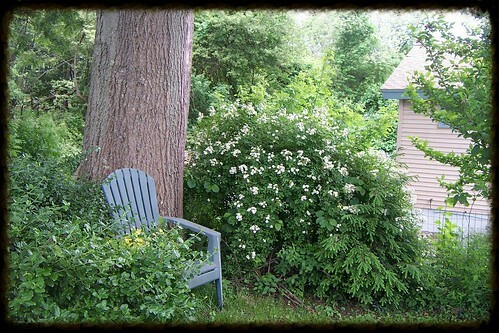 Here is an old photo showing the same area of the yard but just after I’d planted the hollies. The red arrow points to them, I believe there were 5 of them. 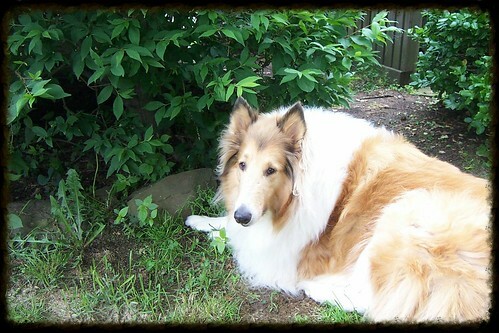 … is pointing to the tiny holly bushes after I had just planted them there. 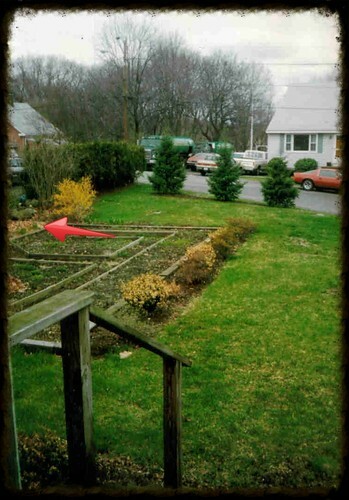 We used to have our vegetable garden out front, but we moved it around back. Now we don’t have a vegetable garden at all. We noted when we traveled to England, the holly plants there are huge, towering over things in the forests. They really thrive there in that wet climate in England. I wanted our hollies to grow like the ones we saw in Yorkshire, and these, although they are not nearly as tall, are certainly not disappointing me. They make a very nice living fence along the property line. And blending in with the hollies to the left are two barberry bushes, with prickers galore, that I had planted out by the front steps not long after we moved here. We moved them over there to make the living fence continue on down the property line. The birds love to flit in and out of all that foliage, which stays all year long and never gets bare. I like that part. I can always count on my Kip for good company when sitting outside on a fairly nice spring day like today. The skies are a white color now, though, which means we will be getting rain later on. That’s OK with me. Rain makes the plants grow, and you can see how much that makes me a happy camper here. Bonnie, you had me searching for a yellow dandelion and I couldn’t find one, but when I went back to the photo you pointed out, yes, there are dandelion leaves there. We do have our share of dandelions, but right at this moment, none are showing. I love dandelions and don’t yank them out. They are a beautiful color of yellow and have just as much right to live in the garden as the others. I think the word “weed” should be banned from our language. 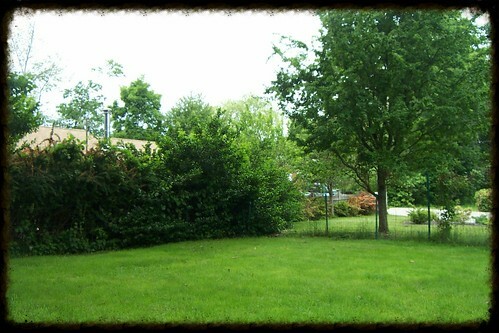 Beautiful yard. I know nothing about plants or gardening. I do recall my grandparents’ had large holly bushes at the back of their rock garden though. 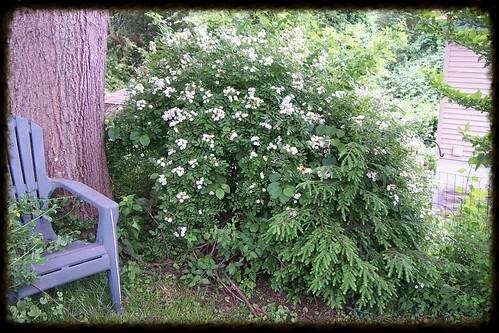 I also have encountered barberry bushes. Those will make a fence all right! Good luck to anyone trying to get through those. So pretty that I could eat it! In the last picture to the left, do I see a dandelion? 🙂 Indeed your yard is beautiful. 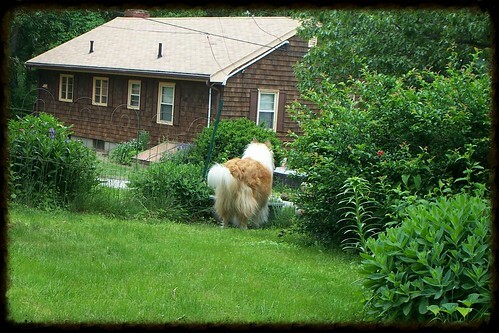 Your yard is so nice….everything growing as it should.